נעבאך .מילא, י"ד החזקה .פלייש? !??! let them 100,000 and more eat meat daily and of course on shabos v'yom tov, אין שמחה אלא בבשר their standards in kashrut is second to none, SR z"l wrote a letter and every satmarer knows it. 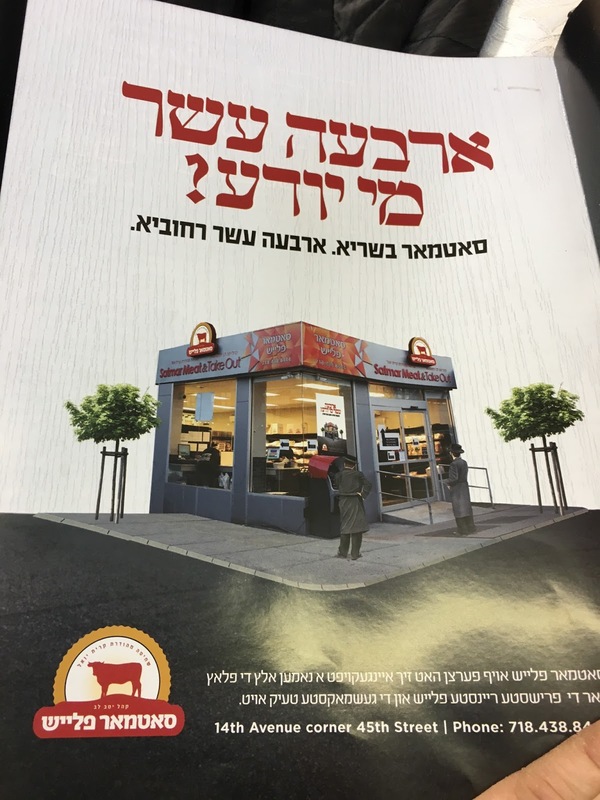 requesting that all "his chasidim" to buy meat only in his butcher stores. which most do. besides it's a huge income for the kehilos! so it's naturally competitive. besides they attract a huge none Satmar clientele, for the high standards in kashrut and otherwise. concerned: "phone calls from irritated vayblech and such. Lee Avenue has 4 Satmar Fleish Geshefts"
these vayblech don't drive.. and each will call sooner or later. they should have more stores spread out so these vayblech may walk in too. V. Chabad never eats meat. Hope the consumers of the meat fare better than the "slov" eaters in the Midbar.Oy,give me the herring of Chortkov instead of the flanken of Romania. דו פארשטייסט נישט די חילוק? דא רעדט זיך פון קהל, נישט אייניגע מענטשען. "ווען א חסידות'טע מפורסמת שרייבט א "קאמיק באק" ע"פ דרך התניא, ..דאס קאנסטו יא"
"4,325 Shluchim Declare UN Resolution Null and Void" !!! 2 Chortkover Chassidim were in the mikvah. One says to to the other,"pass the soap". The other replies "no 2 Chortkover chassidim,radio"!!!!!!!!!!!!!!! chad: "I see you keep a list like satan of kitrug on chabad.. keep it up"
Don't thank him, thank Chabad for keeping it up. "Historic Chuppah in Times Square"
That's why the call "you" the most eligible bachelor in town.? I read this blog late afternoons in my florida room facing west while watching the sunset, sipping cognac and having me some hors devours between my cuban cigar puffs..
Chad Gadye Thursday, April 05, 2018 4:38:00 PM. "I see you keep a list like satan of kitrug on chabad.. keep it up"
Der Ravad of Ross st Monday, March 19, 2018 1:57:00 PM. DROR: "this all hasborah is against the torah, its prohibited to learn with a gentile Torah. the 3 oats are being drilled on radio, its Torah (no matter if its halacha or agadah) and it is prohibited." Rabbi Noson Gurary, Reading the Talmud to Justice Scalia!!! While Justice Antonin Scalia was known for his strong Catholic faith, he also found time to learn about other legal traditions – including Jewish law. Visiting the University at Buffalo Law School in 2002, he met with Adjunct Law Professor and Rabbi Noson Gurary and learned about what Judaism has to say on some pressing legal issues. Justice Scalia later wrote to Rabbi Gurary, expressing his appreciation of learning about Jewish law. "yes, but so is the ability to overcome. we are not deterministic machines; we believe we ALL have a range of conscious choices available to us." STEP #1. We admitted we were powerless over food — that our lives had become unmanageable.